Thank you for joining me as we count down to the next MFT release. We are one day away from the big day! All the new Stamps, Die-namics, and Stencils will be available on Tuesday, October 7 at 10:00pm EST. Be sure to check out the MFT Blog to see all the new items being revealed today. Don't forget to leave a comment on the MFT Blog countdown posts, YOU could win one of the five $75.00 gift vouchers. My first card features the new Joyous Christmas Sentiments and the Snow Drifts Cover-Up Die-namics. I created the ornament by using Snow Drifts Cover-Up and a few colors of card stock that were stamped with the Snowflake Flurry stamp set. Once all the pieces were adhered in place, I used the Stitched Circle STAX Die-namics to cut out the circle. The top of the ornament was created from the top of one of the tags in the Tag Builder 4 Die-namics. I added a thick layer of Glossy Accents over the ornament to give it that extra shimmer and shine. 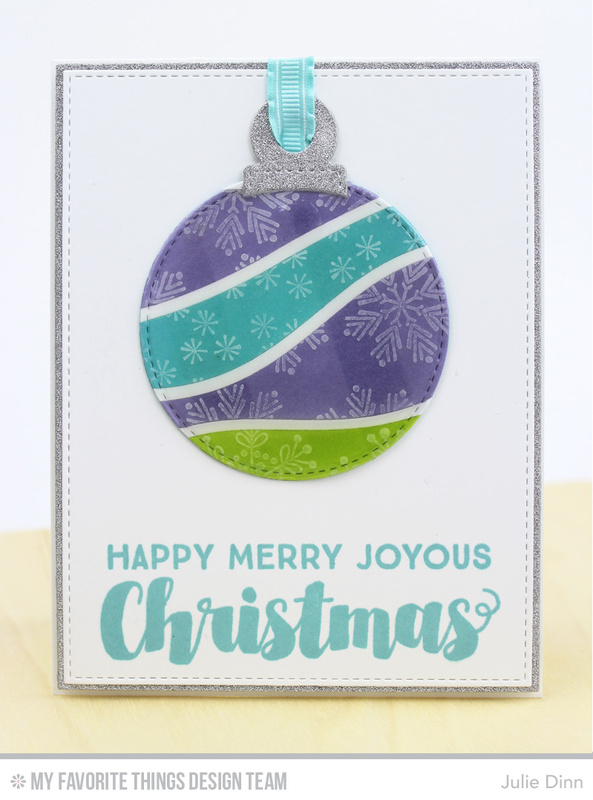 The sentiment from Joyous Christmas Sentiments was stamped in Summer Splash Hybrid ink. 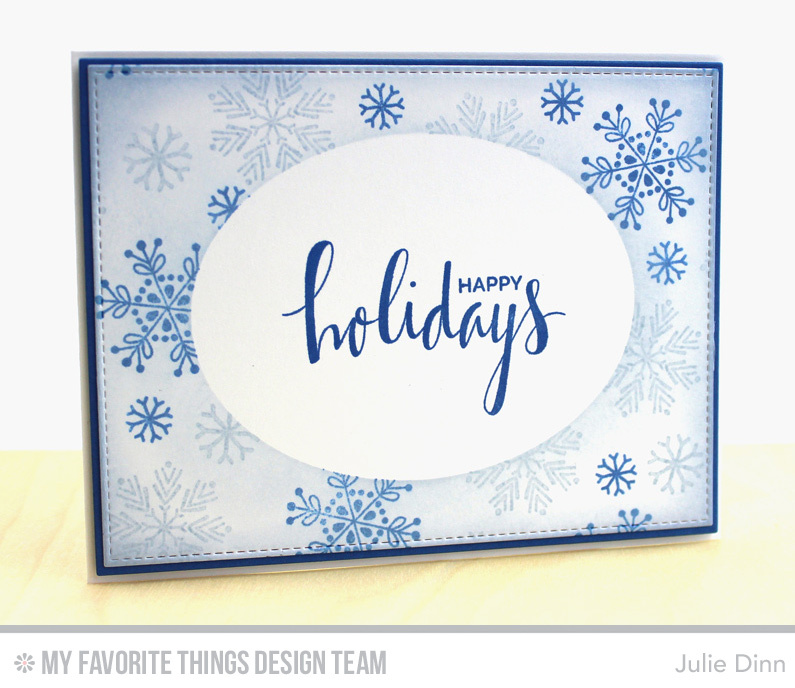 My second card features the gorgeous Hand Lettered Holiday and Snowflake Flurry stamp sets. I LOVE the combination of fonts in the Hand Lettered Holiday stamp set. I stamped the sentiment in Cornflower Hybrid Ink on a piece of Smooth White card stock. I then die-cut an oval out of mask paper and placed it over the sentiment. I stamped the snowflakes in Cornflower and Blue Breeze Hybrid Ink. Once I finished stamping all the snowflakes, I lightly sponged Blue Breeze Hybrid Ink all over the card stock. I love the color combo on your first card. It is fun to use other colors for Christmas cards! Love your CAS cards! Fab color combos. Such a clever way to use the Snow Drift die for ornaments! I love these cards! They are so amazing! Beautiful cards! The new release is awesome. Thanks for sharing! I really like this new die-namics die and your clever use of same with your ornament. Nice job, Julie. Beautiful snowflakes an ornament and flurry card make! I love your first card is so creative and beautiful! Love the colors you used on the ornament! Another great day of cards for this release. Absolutely love the colors you used on the first card.